Like I mentioned before, I put these brakes on bikes that I knew I was going to take anywhere and everywhere. In the past, I have not been a fan of the Juicy lineup due to their on/off feel (not much modulation), noise and overall lever feel. I normally run brakes from Hope and Formula on my personal rides due to their incredible modulation and feel. This is what the Avid Elixir CR’s were going to have to compare to. On the first ride with the Elixir CR’s, I could tell right away that this was going to be a different brake than I was used to out of Avid. The first thing I noticed right off the bat…the Elixir CR’s were quite. I wasn’t getting any howling or the infamous Avid turkey gobble…they were just working. This was a very nice change from the typical Juicy noise. I noticed that the new Avid G3 rotor was also more stable under breaking with no high speed lever chatter. The newly designed rotor cut down on many of the complaints Avid users have had in the past. Overall modulation feel was very progressive throughout the levers stroke. The typical on/off feel that I was used to from the Juicy lineup was gone, and progressive braking took it’s place. Avid’s new Taperbore master cylinder provided a much better overall lever feel than previous Avid brakes. When you combine this modulation with the strong feel of the wide carbon lever, it made for a great feeling brake on the trail. 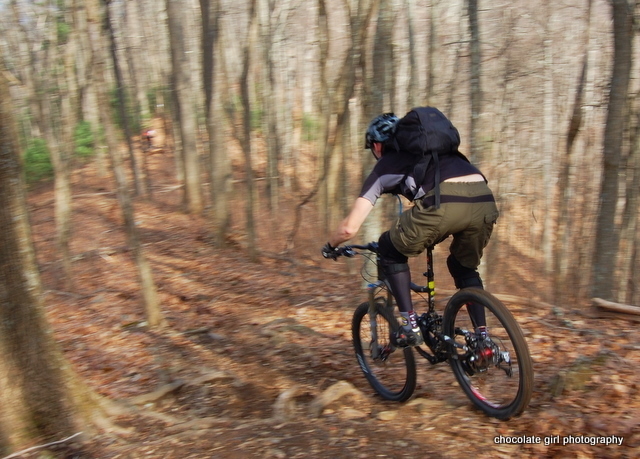 As mentioned before, I was able to dial in exactly how much lever throw there was until lockup on the side of the trail. On most rides, this would not be necessary…but on longer, diverse rides…this was an added benefit. Avid claims that the Elixir brake lineup falls in-between the Juicy and Code brakes. This is accomplished by larger pistons in the caliper body, so I would expect them to deliver enough power for shuttle/dh runs without being overpowering for the weekend warrior or xc racer. Avid delivered just that with the Elixir’s and I give all of that credit to the increased modulation with this line. I did not experience any brake fade or overheating…even during several mile long, technical descents. The brakes were just there every time I needed them and they provided adequate power…that was controllable…under all conditions. Bleeding on the Avid Elixir’s is pretty straight forward by using the Avid bleed system you might already be used to. They are not as easy as the comparable models out of Hope. I would like to see more brake manufacturers adopt a conventional bleeder system (automotive style), but in the meantime…the Avid system isn’t too difficult. If you feel uncomfortable working on brakes, have your local bike shop do the bleeding for you. Just remember that these brakes specify DOT 5.1 fluid. The new top loading pads on the Avid Elixirs make pad change outs much easier than it was in the past. Now, you don’t even have to remove the caliper! Spread the pistons back out using the supplied red pad spacer, remove the pads and reinstall the new pads all through the top of the caliper. It doesn’t get much more user friendly than that. The picture of the rear doesn’t illustrate the adjustable banjo as you have described it. (at least I don’t think) Is that aligned with the frame? That particular setup was the Rocky Mountain Slayer that came in pre-built, so I haven’t touched the brakes on it yet other than minor adjustments. I adjusted the banjo on the Ventana build where I personally installed the brakes. I have a set of these brakes on my DH bike and they are fabulous. After coming from Juicy 7s that I loved, I was pleasantly surprised to find that I like these even more. Relatively cheap, light, adjustable, powerful and great modulation – you can’t really go wrong with the Elixir CRs. On the bike with the Syncros bar and the X.0 shifters…are the brake and shifter on the same mounting bracket. The other bike with the Easton bar shows each has it’s own bracket. The Syncros bars have the SRAM Matchmakers installed. The Matchmakers bring the SRAM shifters and Avid Brakes into one mount. The other bars did not have those installed. I’m looking to buy these but can’t tell what size to order. I have a S-Works Safire. Any suggestions?